Most webinars are limited in terms of the amount of live attendees. By archiving your web based events, you can reach a larger audience with half of the work. Get the extra cost mileage out of your content. Don’t waste valuable time and money producing new content when your content can be accessed indefinitely. Archiving events allows you and your team to internally critique past webinars. Analyze and implement new techniques to optimize your next webinar. Use archived Webinars as material for future productions. The point isn't to recycle all of your old material per se, but rather use them as a starting point for future webinars. Keeping webinars online and available to view can garner potential leads each day. Let your content work for you by keeping it accessible. By archiving webinars you allow audience members who were unable to attend the live event the opportunity to watch it at a later date. Giving the audience an on-demand option speaks admirably about your brand! Looking for a browser-based award winning webinar platform? 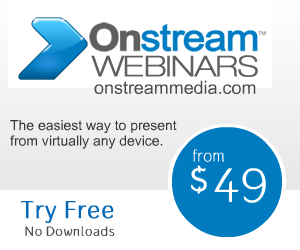 Visit www.onstreamwebinars.com or call 1.888.353.3094 to learn how our platform can benefit you and your business today.